Gary Vaynerchuk (center) with IKONICK co-founders Jeff Cole (left) and Mark Mastrandrea (right). 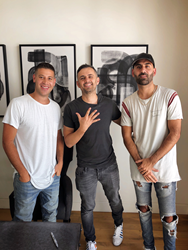 Scooter Braun and entrepreneur Gary Vaynerchuk have partnered with online art retailer Ikonick to help grow the startup by expanding its brand licensing roster. Both will take equity stake in the art e-commerce company. Ikonick (@Ikonick) specializes in canvas art, acting as both the artist and distributor. The company was co-founded in 2017 by Mark Mastrandrea and Jeff Cole, 32 and 29, respectively, and is near $10 million in revenue after 15 months. Cole, the band's digital artist, has over 400,000 personal Instagram followers and has been contracted by Nike, Adidas, Jordan Brand, Disney, Marvel and more. Ikonick currently has brand licenses deal to create exclusive art series for the NBA and Muhammad Ali. With Braun and Vaynerchuk's influence, the plan is to develop signature lines for major brands from entertainment, sports, fashion and beyond. Vaynerchuk also plans to release a signature series with Ikonick this fall. Vaynerchuk said that if he and the rest of the Ikonick team “do our job right in the next 24 months” the brand will grow with brick and mortar retail sales and collaborations as well.